A Little Time and a Keyboard: We'll Always Have Paris: A Mother/Daughter Adventure Winner!!!! We'll Always Have Paris: A Mother/Daughter Adventure Winner!!!! We hope that everyone enjoyed their Mother's Day weekend! 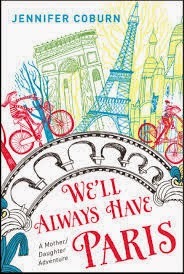 We are so happy to be able to give away one copy of We'll Always Have Paris: A Mother/Daughter Adventure by Jennifer Coburn. The book is perfect for Mother's Day as well as the travel season ahead! Our lucky winner is Danielle J.! Danielle J. has been emailed and has 48-hours to respond or her prize will be forfeited. Congratulations, Danielle! Thank you to everyone that has entered our giveaway. We do have another giveaway coming up, so stay tuned!